Original Editors -Nathan McCauley as part of the Bellarmine University Pathophysiology of Complex Patient Problems project. Osteomyelitis, or bone infection, is an inflammation of bone caused by an infectious organism such as bacteria. However, fungi, parasites, or viruses can also cause osteomyelitis. Acute osteomyelitis is the clinical term for a new infection in bone that can develop into a chronic reaction when intervention is delayed or inadequate. Osteomyelitis can occur for a variety of reasons and can affect all populations but is most common in infants, children, and older adults. Individuals with compromised immune systems, a history of IV drug abuse, or alcohol abuse are more susceptible to developing this rapidly progressing pyogenic infection. The pathophysiology of osteomyelitis is complex and poorly understood. There are several key factors contributing to the infection including: the virulence of the infectious organism, the individual’s immune status, any underlying disease, and the type, location, and vascularity of the involved bone. The prevalence of osteomyelitis has decreased throughout the years due to greater control of the spread of infection in hospitals as well as a better understanding of osteomyelitis treatment approaches. This enables the infection, in many cases, to be caught within 48 hours and prevented from becoming a chronic recurrence. The incidence of osteomyelitis in children has decreased to 47/10,000 in 1990 from 87/10,000 in 1970. The incidence of vertebral osteomyelitis has been estimated at 2.4 cases per 100,000, with the risk increasing with age (0.3/100,000 among individuals <20 years of age to 6.5/100,000 among individuals >70 years of age). Osteomyelitis of the spine is rare, accounting for only about 2-4% of all cases. The primary manifestations of osteomyelitis may vary between adults and children. In adults, back pain is typically the chief complaint but once the infection becomes systemic, a low-grade fever may be present. Children are more likely to present with acute, severe complaints, such as high fever and intense pain, but in some cases the predominating symptoms are edema, erythema, and tenderness in the infected area. In both cases, pain may not always be a factor early in the infectious process due to the lack of pain fibers in cancellous bone. When the infection extends into the periosteum of the bone, individuals may experience joint pain, decreased function, and systemic signs, such as fever, swelling, and malaise. Individuals may also present with increased pain, described as deep and constant, during weight bearing and may exhibit an antalgic gait pattern when the infection involves the lower extremity. Range of motion of the lumbar spine may be decreased and painful at the end range of motion with vertebral involvement. “Sausage toes”, a clinical sign that has been shown to have good sensitivity and specificity, can help determine the presence of osteomyelitis affecting the phalanges of the feet in diabetic individuals. Systemic Lupus Erythematosus (SLE) can also be associated with developing osteomyelitis. In fact, one fourth of all persons with Lupus develop progressive musculoskeletal damage in the form of arthritis, osteoporosis with fracture and vertebral collapse, and osteomyelitis. Medical diagnosis is often difficult because of the lack of specific signs and symptoms, especially in chronic osteomyelitis. Signs and symptoms that are usually associated with infection may be mistaken for normal postoperative changes. May not detect bony abnormality in infections less than 10 days in duration. Lytic lesions may be demonstrable on radiographs within 2 weeks of onset of the infection. Magnetic resonance imaging (MRI) and isotope bone scans are the procedures of choice to delineate the diseases anatomic extent. Flourine-18-flourodeoxyglucose positron emission tomography (FDG-PET) scans provide accurate localization of infection and/or source of fever of undetermined origin, thereby guiding further testing. Osteomyelitis can occur in a variety of bones in different areas of the body. The area affected often depends on the causative agent, the individuals’ age, and previous medical history as certain types of osteomyelitis can affect different populations. The bones commonly involved in children are long bones (adjacent to growth plates) such as the femur, tibia, humerus, and radius due to the amount of bone marrow present in long bones. Osteomyelitis in adults usually affects the vertebral column, in particular the lumbar spine, the sacrum, and the pelvis. Staphylococcus aureus is the usual causative agent of acute osteomyelitis. Once bound to cartilage, the organism produces a protective glycocalyx and stimulates the release of endotoxins. Other organisms such as group B streptococcus, pneumococcus, Pseudomonas aeruginosa, Haemophilus influenza, and Escherichia coli are also capable of producing bone infection. In individuals diagnosed with sickle cell anemia, Salmonella infection can be associated with osteomyelitis. Surgical procedures, open fractures, and implanted orthotic devices are also causative agents of acute osteomyelitis. A form of osteomyelitis, exogenous osteomyelitis, occurs when bone extends out from the skin allowing a potentially infectious organism to enter from an abscess or burn, a puncture wound, or other trauma such as an open fracture. These examples of osteomyelitis secondary to infection are common in immunocompromised individuals and in those diagnosed with diabetes mellitus or severe vascular insufficiency. Hematogenous osteomyelitis is acquired from the spread of organisms from preexisting infections such that occurs in impetigo; furunculosis (persistent boils); infected lesions of varicella (chickenpox); and sinus, ear, dental, soft tissue, respiratory, and genitourinary infections. Genitourinary infections can lead to osteomyelitis of the sacrum or iliac. Immediate treatment is indicated for osteomyelitis, especially in the acute phase. Treatment is usually initiated with an antibiotic, determined by the results of the bone biopsy or cultures taken, given intravenously at a high dose. Factors such as the patients age, health status, location of infection, and prior antimicrobial therapy are taken into consideration when determining the antibiotic used for treatment. The antibiotics are usually prescribed for 4-6 weeks followed by >8 weeks of oral therapy. Amputation of the infected limb. Physical therapists can play a vital role in the screening process for osteomyelitis. Individuals who present with signs and symptoms of infection, possibly causing osteomyelitis, should be referred to a physician for further diagnostic testing. These signs and symptoms are included in the above section. Prevention is another area in cases of osteomyelitis where physical therapists can play an important role. Chronic osteomyelitis is often a result of complication of treatment with open fractures, therefore, prevention of infection is highly important. Since the role of nutrition is vital in cases of infection, patient need to be properly educated on proper nutrition in early post-surgical intervention due to the fact that most infections occur in the immediate post-operative period. Individuals who are at risk for developing osteomyelitis should also be taught proper preventative measures and be aware of early warning signs that infection may be present such as, excessive pus present coming from incision line, redness, extreme tenderness, increased skin temperature near area of injury or surgical procedure, and symptoms of nausea or vomiting. If treated surgically for osteomyelitis, physical therapy may be indicated post-operatively to address any impairments in strength, ROM, proprioception, etc. as well as treatment for any functional limitations or disabilities secondary to the infection. Tomaszewski D, Avella D. Vertebral osteomyelitis in a high school hockey player: a case report. J Athl Train 1999;34(1):29-33. Kline A. Streptococcal Group-B Osteomyelitis of the foot: a case report. Podiatry Internet Journal 2007;2(1):3. Endovascular treatment of a ruptured thoracic aortic pseudoaneurysm secondary to Pott disease during a spine surgery: A case report and a literature review. Osteomyelitis due to methicillin-resistant Staphylococcus aureus successfully treated by an oral combination of minocycline and trimethoprim-sulfamethoxazole. Revision of Syndesmosis Screw Fixation. ↑ 1.00 1.01 1.02 1.03 1.04 1.05 1.06 1.07 1.08 1.09 1.10 1.11 1.12 1.13 Goodman CC, Fuller KS. Pathology: implications for the physical therapist. 3rd ed. St. Louis, MO: Saunders; 2009. ↑ Zimmerli W. Vertebral osteomyelitis. N Engl J Med 2010;362:1022-1029. ↑ Boeglin ER. 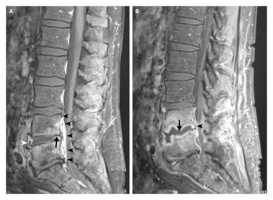 Vertebral osteomyelitis presenting as lumbar dysfunction: a case study. JOSPT 1995;22(8):267-271. ↑ The Cleveland Clinic Foundation Staff. Osteomyelitis. The Cleveland Clinic Foundation. http://my.clevelandclinic.org/disorders/osteomyelitis/hic_osteomyelitis.aspx. Accessed March 16, 2011. ↑ 6.0 6.1 Mayo Clinic staff. Osteomyelitis. The Mayo Clinic. 2010. http://www.mayoclinic.com/health/osteomyelitis/DS00759 (accessed 6 April 2011). ↑ Goodman CC, Snyder TK. Differential diagnosis for physical therapists: screening for referral. 4th ed. St. Louis: Saunders Elsevier, 2007. ↑ Carek PJ, Dickerson LM, Sack JL. 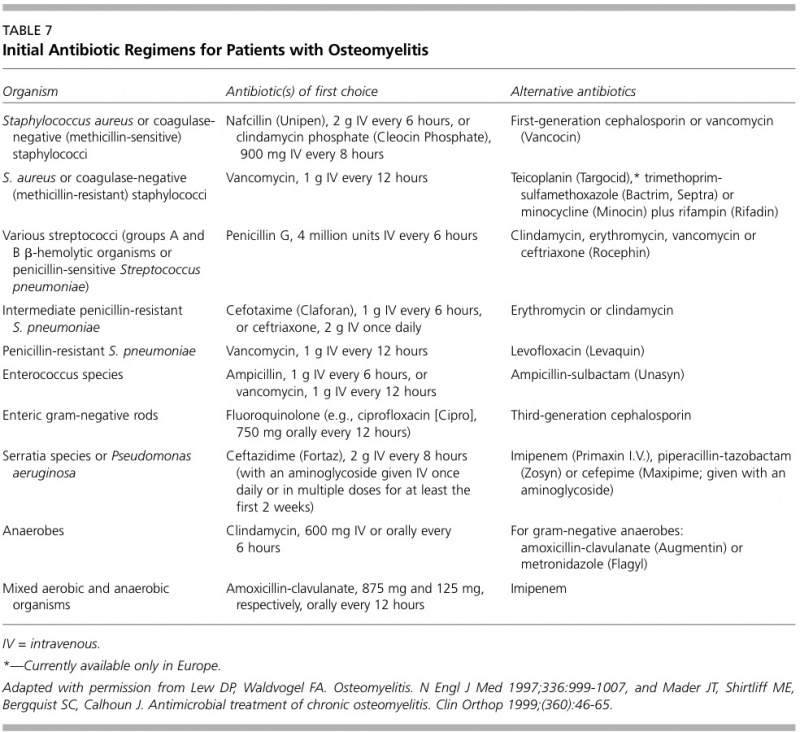 Diagnosis and management of osteomyelitis. Am Fam Physician 2001;63(12):2413-2420. ↑ Nuermberger E. Osteomyelitis, chronic. John Hopkins Plan of Care Information Technology 2009. http://hopkins-abxguide.org/diagnosis/bone_joint/osteomyelitis/full_osteomyelitis__chronic.html (accessed 17 March 2011). ↑ Willis K. Osteomyelitis. Stanford University Medical Media and Information Technologies 2003. http://osteomyelitis.stanford.edu/pages/main.html (accessed 3 April 2011).